Greetings, Elyrians! 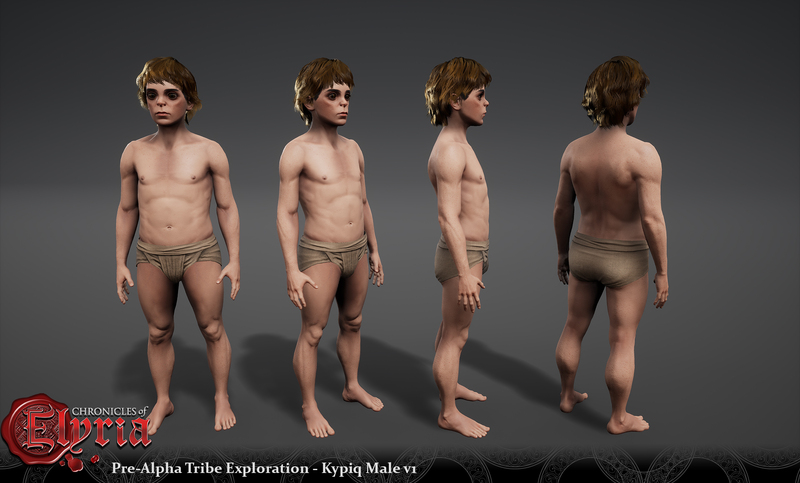 Last time we checked in on our latest internal release, we showcased visual targets for the tribes in Chronicles of Elyria and looked at a few work-in-progress screenshots of our character creator. Earlier this week, we broadcasted a live walk through of our character creator, and took suggestions from the Twitch chat. In case you missed it, you can watch the video below. Throughout the video, we showcase both the eight starting tribes, and the four discoverable tribes in Chronicles of Elyria. We create a few different characters and dive into the details here and there, but if you need an additional recap, read on to find out more! Before we work on getting the representation of the tribes in the game, we sculpt model targets to ensure we're hitting the vision of each tribe. Below are some of the targets we crafted to help guide the character creation process. Although Chronicles of Elyria is a fantasy game, we want the ranges of character creation to be realistic. This means that we need to create constraints for each of the tribes when it comes to customization sliders - so no, you can't create big-head mode. We're creating an immersive experience, and that means each character created in game needs to look and feel like they belong to the tribe to which they are born. As with the body constraints, each of the tribes of Elyria have a range of visual characteristics for different facial attributes. We're still tweaking the constraints and ranges, but we're pretty happy with where we've landed so far. And of course you'll be able to give us additional feedback once My Akashic Records (a standalone executable where you can see your character and some of the items you own) is in the hands of Alpha backers. Soon™. When you create a character, you choose a birthday and, with each individual birthday, there is a specific alignment of the planets associated with it. As revealed in the livestream, your birthday plays a key part in what sort of destiny may unfold for your character. As to the specifics of how this interacts with our destiny system...you'll have to discover it for yourself at launch. Lastly, we decided to split up work for this release. Internally, we've called it the 0.2.0 release. The next production update will be from Vye, and she'll address what we're working on currently in our 0.2.5 internal release, which includes world interaction and inventory management. If you enjoyed the broadcast, please follow our Twitch channel and you'll get alerted when we go live! We're looking forward to showing off more of the game in the coming weeks. the character creation mode looks great! Great job! Much encouragement! Wow this is looking amazing. I really love the character creation mode, it really looks looks like a finished product at this screen. Keep up the good work, Idk if I can decide now on my race. I really need to look at all the images and names near them in the stills to really decide haha. Character creation looks great! Just what I was hoping for. Can't wait for more! Kipiq are the size of a Yoru's foot. Anyway it looks fantastic atm and of course with the creator being unfinished with the characters it's coming along nicely. *someone to make a Hrothi character and call him willow* Anyway it looks fantastic atm and of course with the creator being unfinished with the characters it's coming along nicely. Spending hours playing around with character creation is something I do in any game it's available. I love fiddling with different combinations and am quite happy to see so much variety. I feel so attacked with this update. I've already been having trouble deciding on a name because I was pretty sure I was just going to go with a Neran county, so I was trying to find nice Neran names so I can reserve one. Naturally after I watched this I don't know what tribe I want anymore, which means I don't even know what kind of name I want either. Thanks, Soulbound. You're enabling my indecisiveness. ...but all of that was really cool to see and between the wide range of options on all the tribes being able to look great, and the fact that all the environments shown so far look beautiful, I'd be happy with any tribe, and 1000% want a Mydarri pirate someday because those eyes seem pretty awesome and I absolutely love the real world biology pulled into these tribes. Now excuse me while I continue to stare at lists of names for hours on end. I feel so attacked with this update. I've already been having trouble deciding on a name because I was pretty sure I was just going to go with a Neran county, so I was trying to find nice Neran names so I can reserve one. Naturally after I watched this I don't know what tribe I want anymore, which means I don't even know what kind of name I want either. Thanks, Soulbound. You're enabling my indecisiveness. ...but all of that was really cool to see and between the wide range of options on all the tribes being able to look great, and the fact that all the environments shown so far look beautiful, I'd be happy with any tribe, and 1000% want a Mydarri pirate someday because those eyes seem pretty awesome and I absolutely love the real world biology pulled into these tribes. Now excuse me while I continue to stare at lists of names for hours on end. Regarding the months, they're named after deities in the Qindred religion in the video. If you were to use a tribe that doesn't traditionally worship the Qindred (IE a Janoa), would the month names change alongside it? Hello Boomel. Nope the names would not change. It's similar to our own world where for instance the month of August is named in honor of the Roman Emperor Augustus who was deified and the month of June is named in honor of the Roman goddess Juno and so on. Historically in Elyria the Qindred religion is among the oldest so it seems its cultural legacy influences all the tribes. Posted By **boomel** at 7:53 PM - Sun Mar 25 2018 > > Regarding the months, they're named after deities in the Qindred religion in the video. If you were to use a tribe that doesn't traditionally worship the Qindred (IE a Janoa), would the month names change alongside it? Hello Boomel. Nope the names would not change. It's similar to our own world where for instance the month of August is named in honor of the Roman Emperor Augustus who was deified and the month of June is named in honor of the Roman goddess Juno and so on. Historically in Elyria the Qindred religion is among the oldest so it seems its cultural legacy influences all the tribes. Looks very nice, can't wait to use it myself ! Gona spend plenty of time playing around in character creaton whenever we get our hands on it. Looks promising even with uncompleate faces and features. Yoru looks amusingly hideous so I have high hopes of getting my lovely Dras lass looking creepy enough when the same work is compleated for her tribe. Gona spend plenty of time playing around in character creaton whenever we get our hands on it. Looks promising even with uncompleate faces and features. Yoru looks amusingly hideous so I have high hopes of getting my lovely Dras lass looking creepy enough when the same work is compleated for her tribe. Character creation looks very good. But the models themselves look too plastic. Overall I feel like this stream was a success. It's content like this that will help keep the community engaged and dedicated to Chronicles of Elyria. =) Great work. "My Akashic Records (a standalone executable where you can see your character and some of the items you own) is in the hands of Alpha backers. Soon™." Is My Akashic Records going to be available for all Alpha backers or just Alpha 1? I just wanna quickly chime in and say that I love everything you guys are doing with the tribes and sense of identity in this game. In terms of looks, clothing, culture or background everything feels very much rooted in medieval life and archetypal fantasy structures - but the unique touch that you bring to it is refreshing. I will very much enjoy inhabiting this world. Loved the stream. Really excited for the My Akashic Record as well. Definitely going to spend some hours in that. Excellent update, very pleased with the character models and customisation potential. I think keeping the tribes with their original set of distinctive features would be best - interbreeding will soften those features over successive generations in all but those bloodlines who choose to remain purists. As such, their starting features will represent the extremes of each tribe - its "starting point", so to speak. Either way, very much looking forward to more. Great work! Excellent update, very pleased with the character models and customisation potential. I think keeping the tribes with their original set of distinctive features would be best - interbreeding will soften those features over successive generations in all but those bloodlines who choose to remain purists. As such, their starting features will represent the extremes of each tribe - its "starting point", so to speak. Either way, very much looking forward to more. Great work! looking forward to it, and i will keep to my word. once i see game play i'll drop $300 on this. looking forward to it, and i will keep to my word. once i see game play i'll drop $300 on this. Exciting stream and great progress! Looks cool but some of them looks the same with only very slight differences. The Yoru, Kypic, Hrothi, Erishe look unique enough but their faces look way to similar. In real life Humans look very different to each other. You can glance at one and immediately know their decent. Those of European stock look different to those of Asian or African stock. The bodies are more or less the same but there are differences in the bone structure in the face and certain racial features such as the African nose and the Asian eyes. Will you be adding features like this to make the tribes look more unique? Looks cool but some of them looks the same with only very slight differences. The Yoru, Kypic, Hrothi, Erishe look unique enough but their faces look way to similar. In real life Humans look very different to each other. You can glance at one and immediately know their decent. Those of European stock look different to those of Asian or African stock. The bodies are more or less the same but there are differences in the bone structure in the face and certain racial features such as the African nose and the Asian eyes. Will you be adding features like this to make the tribes look more unique? Oh, you might have missed it in the video, but Vye and Caspian actually talk about this in the stream when they start to show off the Yoru for the first time. Most of the tribes are still in the production pipeline, which means they are missing a few elements such as the normal maps that bring out the different shapes in their faces. The Yoru faces in this video are further along in the process though and more indicative of the differences we can evoke. ahh, yup I missed that part. I sleep during the day so I kept drifting off. Character creation and the customization of each tribe looks great, keep it going ! Sexiest blog post to date!